New look for SDCCD’s Web E-mail Login Page! 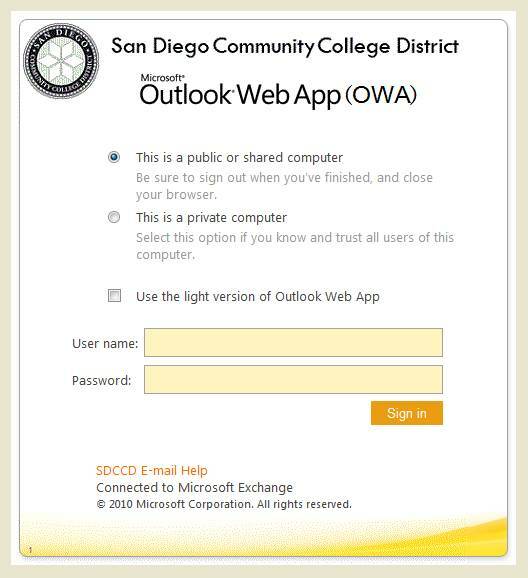 In preparation for the District's migration to Exchange 2010, the Outlook Web App (OWA) Sign in page has a new look. Your sign in remains the same and will send you to your current District e-mail web client. When your mailbox is upgraded to Exchange 2010 (planned for Summer/Fall 2011), this page will automatically redirect you to the new 2010 Web Client. If you have any problems or questions with this procedure please call the Help Desk at 619-388-7000.